Action from the Nene Valley 10 at Bretton. Top local road runner Aaron Scott raced to a convincing victory in the Nene Valley 10 yesterday (December 6). 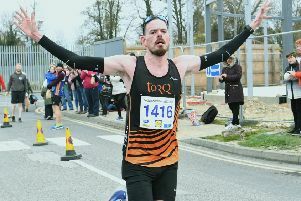 The Stamford-based Notts AC man finished over half a minute clear of runner-up Steve Robinson from Peterborough Athletic Club. Scott clocked 53:38 with Robinson timing in at 54:11. Joseph Turner from the promoting Nene Valley Harriers club was third in 55:46. First female finisher was Lisa Marriott from Ramsey Road Runners in 51st place in 65:50. Battling it out in the Nene Valley 10 are, from the left, Lloyd Kempson, John Pike and Josh Reed.